Finding great eats in boho-chic joints, where locals go. Here’s a nod to the best in the area. In the heart of Carmel-by-the-Sea, breakfast starts at 8am every day. My favorite is Brioche toast, avocado and poached eggs with an arugula salad. Add a side of their homemade sausage and a glass of Chardonnay from the Georis winery to complete a rustic blend of wonderful tastes to begin or end your day. And don’t forget a chocolate croissant to go. Baked fresh on site every morning. Down Carmel Valley Road past the wineries, nurseries, and horse ranches, Cafe Rustica in Carmel Valley Village serves delectable thin crust wood-fired pizzas paired with local wines. It’s hard to choose from such gourmet ingredients such as Italian fennel sausage, prosciutto, creme fraiche, carmelized onions and smoked salmon. 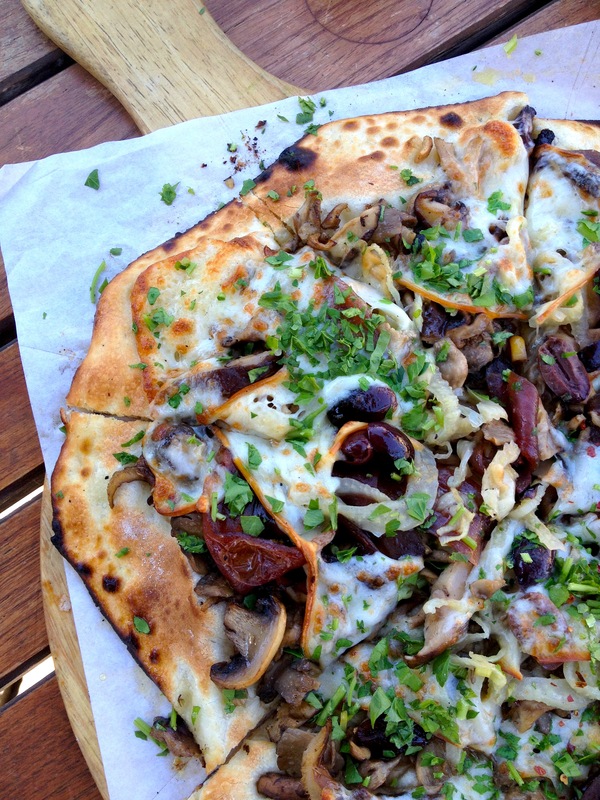 A favorite is the Mushroom Pizza with Shiitake, portobello, oyster and white mushrooms with carmelized red onion, shaved fennel and smoked mozzarella cheese, as pictured. Delicious. Lunch at Crystal Fish offers a great “bento box” with 2-3 selections from 10 types of sushi, sashimi, teriyaki or tempura. $10-14. Discover Patria in old Salinas. A feast for the eyes and the palette. 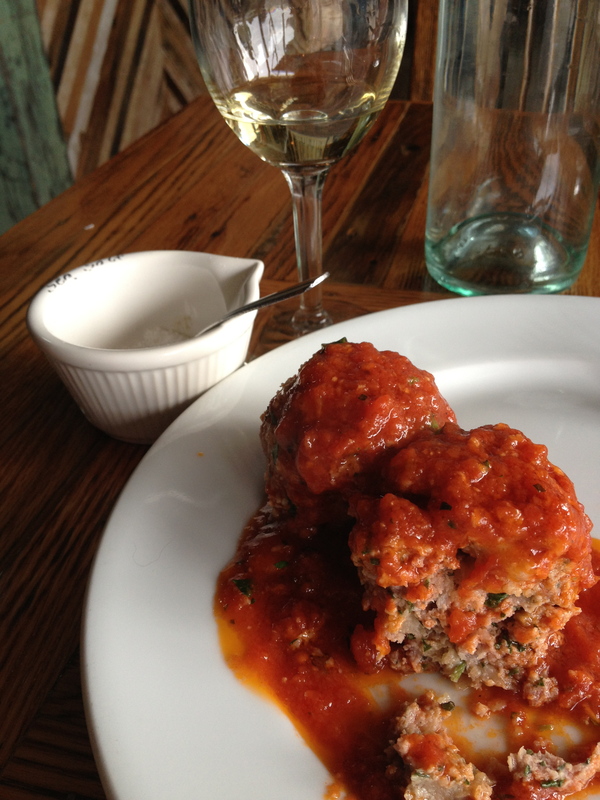 Offering Happy Hour daily with family-style plates of tastings and great wines. A touch of Country French antique vignettes and bistro table settings, set the tone for wild boar pasta, charcuterie and margherita pizza. See post for more. The creator of il vecchio lived in Rome for eleven years and has brought to the Monterey Peninsula great old-world Italian influences to it’s menu. The name means “the old,” but the interior of this hip eatery, designed by the owner’s daughter, has hand-crafted walls and furnishings of resalvaged pieces that create a current vibe. Don’t miss the Workman’s Lunch, Monday-Friday, which is served family style. You will be delighted when your server comes to the table with a steaming hot skillet and spoons onto your plate the pasta and risotto or polenta of the day, accompanied by the most delicious salad. Only $9.50. Great wines, great tastes, great prices. Wine and espresso bar by day, and now serving lunches & brunches Wed-Sun. Staged in a charming Pacific Grove house, Crema brings to the area homemade burritos and pastries while serving Verve coffee. Besides offering one of the best burgers in the area, check out their grilled cheese sandwiches and tri-tip chili fries. Their super-popular brunch has probably the best Chicken & Waffles with Sausage Gravy you will ever find anywhere. A young, hip group of servers are friendly, knowledgeable and have been with Crema since day one. Try their morning glory muffins. To die for. Hidden away, off the main street in Carmel, is Mundaka. It’s small and artsy with Spanish tapas, great wine and good service. Brown kraft paper serves as a runner on each table, stamped with the restaurant name. Wine comes in a tumbler and water is served in very cool small glasses. Fresh, sustainable cuisine. A regular stop for locals and the best hidden secret for savvy tourists.